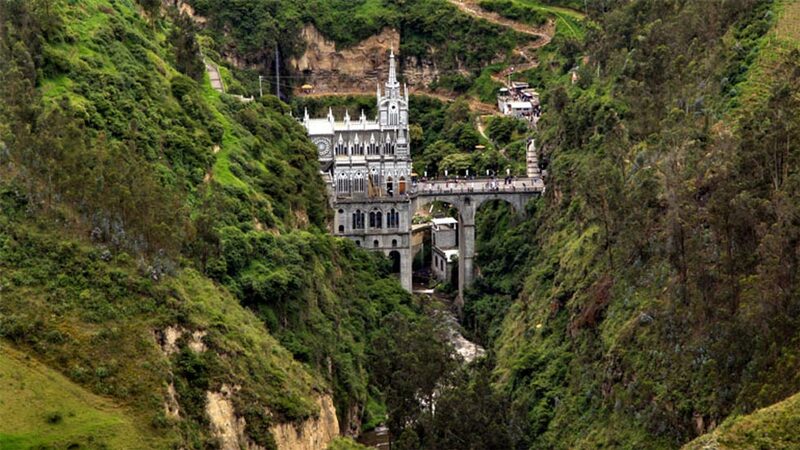 The Las Lajas Sanctuary in southwest Colombia has made a name for its stunning architecture and a series of myths involving the appearance of the Holy Virgin and a mysterious mural of which nobody knows how it got there. 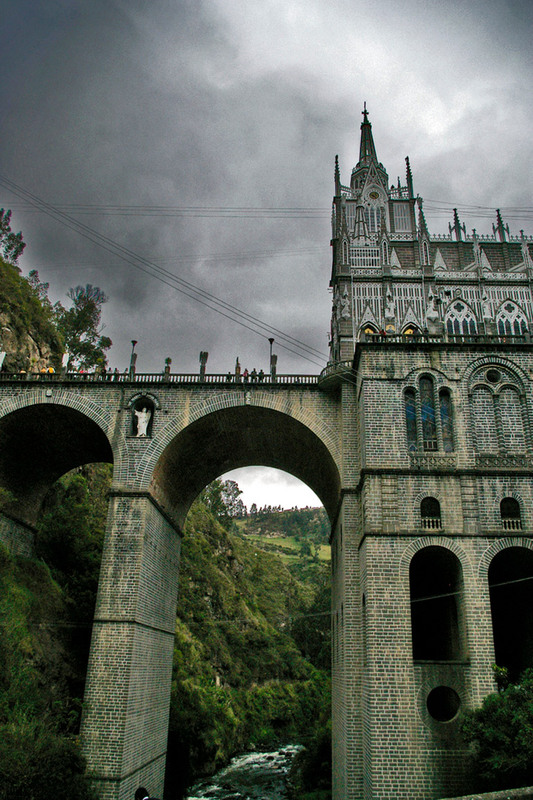 Located in the southwestern Colombian state of Nariño, the Las Lajas Sanctuary sits on a 130 feet tall bridge built over the Guaitara river at less than seven miles from the Ecuadorean border. The neo-Gothic church was erected by worshipers between 1916 and 1953 and replaced a shrine first built in the mid-18th century. According to popular belief, the Virgin Mary appeared to a woman and her deaf-mute daughter in 1754 at exactly the same place where the church is now standing. 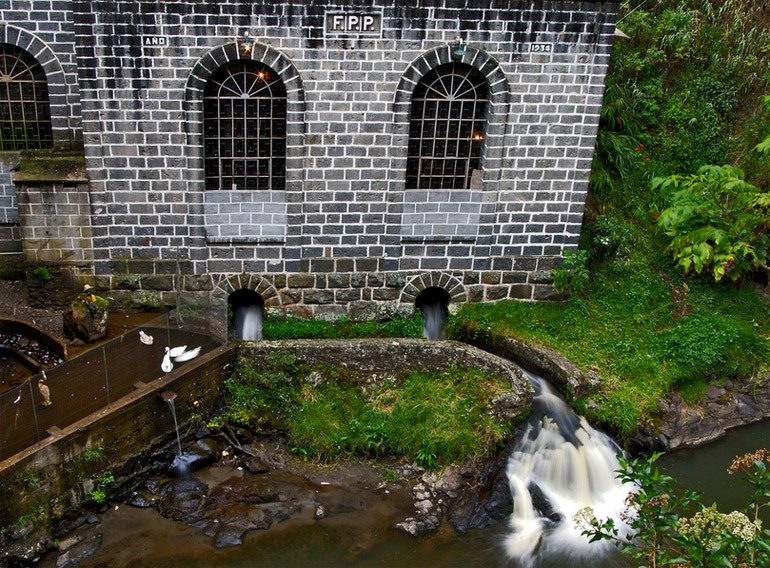 The woman, Maria Mueces, and her daughter, Rosa, were passing by the Guaitara river when they found themselves hiding from a storm. At that moment that Rosa shouted “Mum, the Virgin is calling me!” and pointed to the appearing virgin. The woman kept quiet about the miracle until something even more incredible happened. When Rosa died, Mueces returned to the place where they had seen Virgin Mary to pray for her daughter’s soul. The virgin then miraculously revived Rosa, and mother and daughter could no longer keep the miracle a secret. The first shrine in the honor of Jesus Christ’s mother was built a few years after the alleged virgin appearance, according to the journal of a friar who was traveling the region between 1756 and 1764. Half a century later, in 1802, a bigger shrine was built and worshipers erected the first version of the bridge that now allows access to the church. 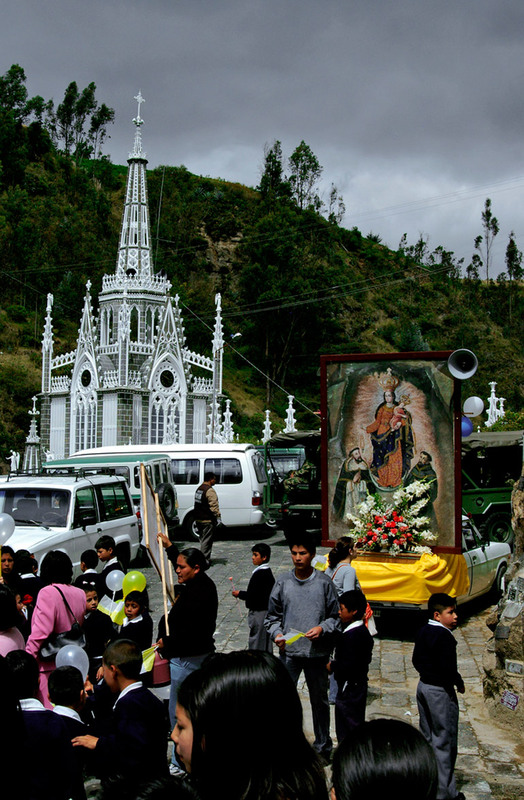 The miraculous appearing of the virgin is only the first of a number of myths and mysteries linked to the Las Lajas Sanctuary. 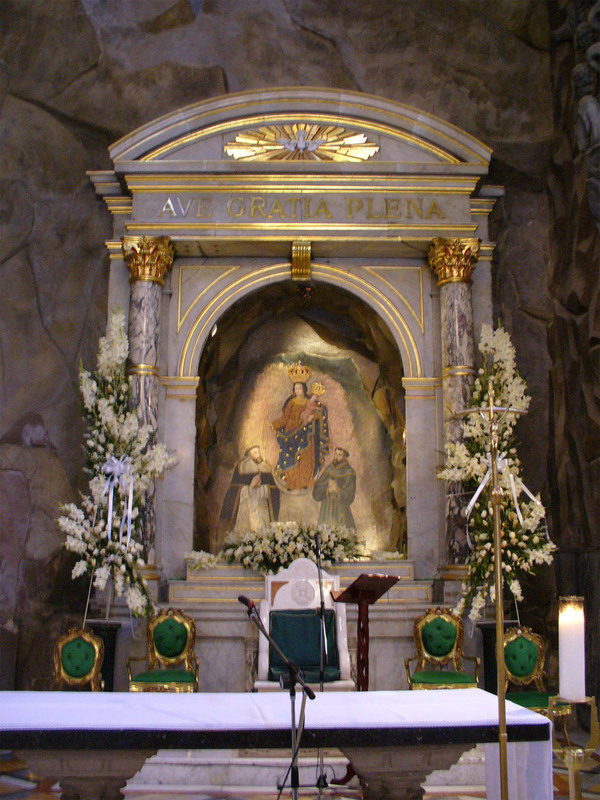 For example, nobody knows who made the image of the Virgin Mary that is at the end of the church, behind the altar. According to some, the image was seen first when Mueces wanted to show a priest and other locals where her daughter had been revived. On arrival, the worshipers saw the image of the Virgin Mary and Jesus carved in a stone wall. The image attracts thousand of pilgrims every year. 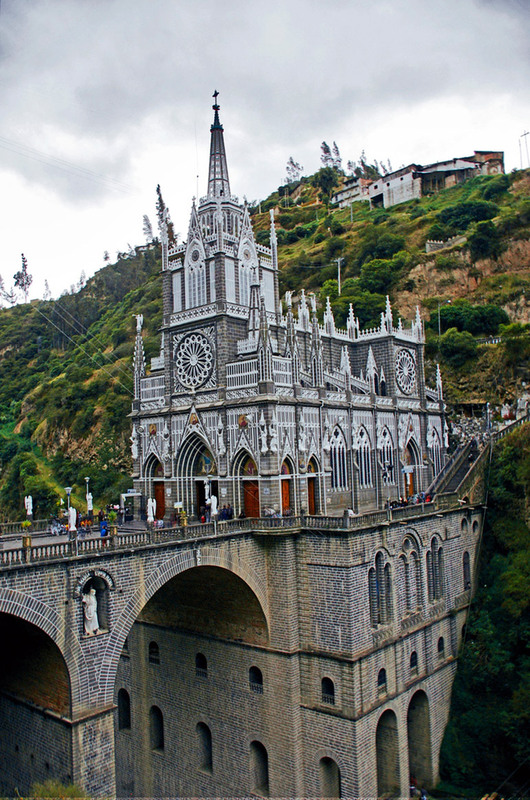 Las Lajas received canonical coronation from the Vatican in 1952 and then made a minor basilica in 1994.